When you're looking to give your scrapbooks and other crafts that final touch of style, add a few charms and buttons. With a variety of styles and designs available, you're sure to find ones that will give you the perfect finishing touch on all of your projects. Choose some stickers to give your scrapbooks some extra color, and then select a few buttons so your project has more depth. You can find buttons with a vintage look or a modern touch to perfectly complement your crafts. When your projects need all the sparkle and shine you can find, turn to beautiful charms in an array of colors. Rhinestone charms come in a variety of shades to match the other parts of the project you're completing. Choose charms that have heat transfer backing to make it easy to add them to paper, clothing, and more. 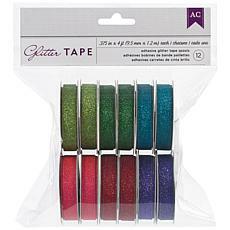 Finally, don't forget to get some glitter to sprinkle over your scrapbooks, cards, and other paper projects for that final touch of sparkle. When you need to give your craft projects some extra embellishment, shop the great selection of charms and buttons you'll only find at HSN.